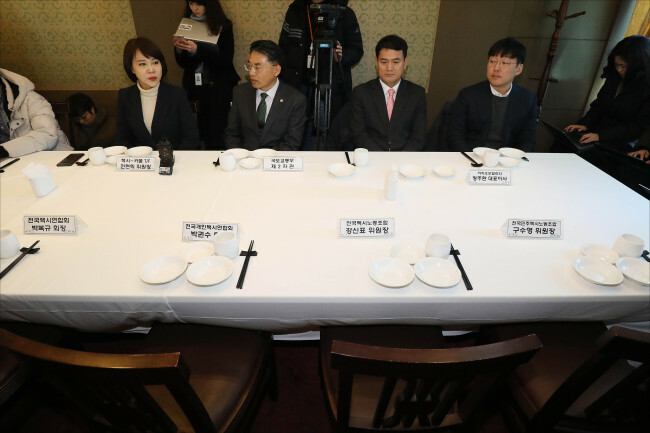 The heads of four taxi associations boycotted a meeting with the government and the ruling party on Friday over shared mobility, an official said, showcasing the uphill battle to overhaul South Korea's transportation sector. The meeting was meant to lay the groundwork for the creation of a social dialogue body on carpooling services by Kakao Mobility Corp., the operator of South Korea's largest taxi-hailing app. "A social dialogue body can get off the ground once taxi officials join a meeting," said an aide to Jeon Hyun-heui, a lawmaker of the ruling Democratic Party who leads a task force on shared mobility. The boycott illustrated the growing strain between technology-driven mobility companies and conventional taxi drivers. "We will make efforts to resolve regulations through a social deal," Hong Nam-ki, the minister of economy and finance, said Thursday in a meeting with reporters in Sejong, an administrative hub located 130 kilometers southeast of Seoul. Four taxi associations, which speak for taxi companies and drivers in South Korea, have pressed the government to stop what they claim is "illegal carpooling services," calling it a precondition to their participation in a meeting with the government and the ruling party. Kakao has said it will restrict ordinary people to offering carpooling services to commuters at only two time periods a day -- usually during the morning and evening rush hours -- in line with the current law on passenger transport service. One taxi association stressed that the exception clause was meant to encourage ordinary people to carpool with their colleagues and neighbors to ease traffic jams. Taxi drivers claim carpooling services would eventually take away their passengers and that the services could be used 24/7, as flexible working hours have blurred the traditional notion of commuting hours. Kakao Mobility began a limited version of its carpooling service earlier this month to work out technological details and reflect on various opinions ahead of its formal launch.